Defense and public security leaders from Central America joined their counterparts from U.S. Southern Command (SOUTHCOM) and observers from five partner nations during the 2018 Central American Security Conference (CENTSEC) May 9-10 in San Salvador. The theme of this year’s CENTSEC, “leveraging regional networks to counter shared threats,” reflects the interest of participating nations to expand collaboration, improve information sharing, and better integrate regional security efforts. While welcoming guests at the start of the conference, Maj. Gen. David Munguía, El Salvador’s Minister of National Defense, said the complexity of the region’s challenges calls for dynamic approaches tailored to address present-day threats. “New challenges to the internal security of (nation) states are emerging in the context of advances, progress and globalization; and considering the transnational nature of the different organized crime networks operating in our region, they demand the practical application of modern and far-reaching security concepts,” he said. U.S. Navy Adm. Kurt Tidd, SOUTHCOM commander, who co-hosted this year’s CENTSEC with Munguía, commended participants’ ongoing efforts to integrate their operations, build capacity to secure borders and share information, and protect human rights. He underscored the importance of building on the progress they’ve made and reaffirmed SOUTHCOM’s commitment to the region. The agenda for this year’s conference included a review of threats impacting the region using information shared by the participating nations, initiatives aimed at improving joint and interagency collaboration to counter threat networks, and cyber threats of mutual concern. The nations of Central America have a longstanding history of working together. The Central American Armed Forces Conference, one of the international organizations attending this year’s CENTSEC, promotes positive security cooperation among the region’s militaries. But the region has also sought to expand its cooperative relationship with other security partners, collaborating in increasing ways with nations across the Western Hemisphere and international community. 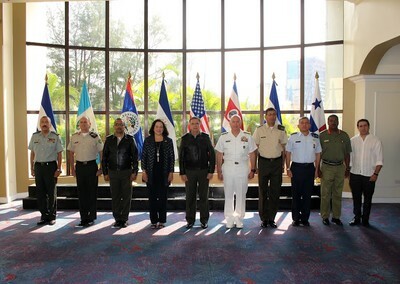 Five Central American nations currently have liaison officers working at Joint Interagency Task Force South, the SOUTHCOM component that supports international detection and monitoring of illicit trafficking and the disruption of threat network activities with the direct support of liaison officers from 20 nations. In his recent written posture statement to the Senate Armed Services Committee, Tidd credited the region’s work with international partners as a significant contributor to the task force’s mission. El Salvador plays an important role in the region, hosting one of SOUTHCOM’s two cooperative security locations (CSL) that conducts maritime air patrols over international waters to support multinational operations targeting threat network activities in the Eastern Pacific and Caribbean Sea. This year marks the third time El Salvador has hosted CENTSEC, having previously hosted the forum in 2012 and 2008. Every nation in Central America has hosted the annual conference, and Mexico hosted the event in 2017. This year’s CENTSEC was held in conjunction with a conference of senior enlisted leaders from nations participating in the annual regional security conference. In addition to attending portions of CENTSEC 2018, they examined similar threats and challenges, exploring ways their corps of experts can support the regional collaboration needed to affectively counter them. Addressing their participation with reporters at the conclusion of CENTSEC, Tidd underscored the vital role non-commissioned officers play in ensuring the success of multinational security cooperation. “As leaders, they offer innovative ideas and perceptions only career experts can provide. They also bring unrivaled competence at integrating with joint, interagency, and international missions – a skill vital to operational success in a world of interconnected threats,” he said. The SOUTHCOM-sponsored conferences are an opportunity for defense and security leaders to strengthen cooperative ties among regional forces, engage in candid dialogue on pertinent issues, evaluate challenges impacting regional security, share successes and lessons learned, and explore ways to enhance security cooperation to build on prior successes.